Karim Chan in action at the national championships. City athlete Karim Chan was in superb form at the Typhoo National Disabilty Championships at Warwick University at the weekend. The 15 year-old Marshfields School pupil, who suffers from autism spectrum disorder, picked up an impressive five gold medals after qualifying to represent the Eastern region team from the regional championships in Chelmsford in May. Karim Chan (second right) celebrates with his relay mates. He took part in three individual events - the 100m, 200m and long jump - and in the 4x100m and 4x400m relay events. And he won gold medals in all five, clocking new personal bests of 12.0 seconds and 25.2 seconds in the two sprint finals. He won the long jump with 5.49m, which was well below his best of 6.14m, but still more than good enough for a comfortable win. That PB of 6.14m not only puts Chan top of the 2016 UK Under 17 rankings, but he also leads the way in the senior men’s rankings with it as well . Chan first took up athletics when he joined the Nene Valley Harriers special needs club in 2013. 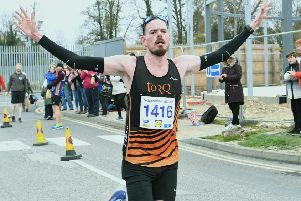 He now competes for Peterborough AC and is coached by Craig Torr classified as a T20/F20 athlete.